Following the successful third AETHSE and the forthcoming publication of the Proceedings we proceed to the organisation of the fourth meeting, from the 15th to the 18th of March 2012. The AETHSE is organised in common by the Department of History, Archaeology and Social Anthropology of the University of Thessaly, the Ephorates of Prehistoric and Classical Antiquities, the Ephorates of Byzantine Antiquities, the Services of Later Monuments and Technical Works of Thessaly and Central Greece, as well as by the Special Regional Services of the Ministry of Culture and Tourism responsible for the above Districts. 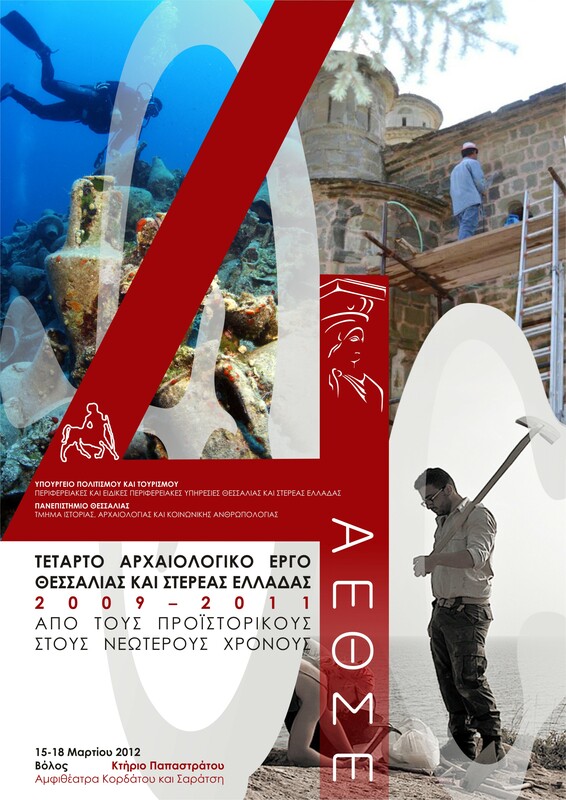 The Services of the Ministry of Culture and Tourism responsible for Thessaly and Central Greece, the Universities, the Research Centres, the Institutes, the Foreign Archaeological Schools and the scholars who are active in the Districts of Thessaly and Continental Greece, are invited to participate. The conference is sponsored by the Ministry of Culture and Tourism, the University of Thessaly and the Municipality of Volos.